East Texas Federal Criminal Defense Attorney - Oberheiden, P.C. What Are the Stages of a Federal Criminal Case in East Texas? The attorneys of the Oberheiden, P.C. handle federal cases on behalf of their clients in courts across the country, including federal courts in Beaumont, Lufkin, Marshall, Sherman, Texarkana, and Tyler. 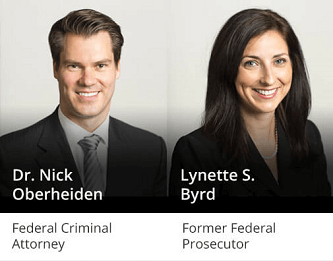 Among the distinct qualifications of the attorneys of Oberheiden, P.C. is the combination of former service for the Department of Justice and years of counsel experience with the federal criminal justice process. Clients interested in learning more about our service or interested in a free and confidential case assessment by one of our senior attorneys should call today and speak with a former federal prosecutor or federal defense counsel at (800) 810-0259. Investigation. The beginning of a federal case is typically cloaked in obscurity. Federal agents working in eastern Texas often begin an investigation without the target’s knowledge and may be weeks, months, or years before a decision is made to proceed with filing a criminal charge. That decision is being made by the U.S. Attorney’s Office for the Eastern District of Texas. Arrest. Once the federal agent in charge of the investigation thinks that he has enough evidence, an assistant U.S. Attorney (AUSA) for the Eastern District will ask one of the federal judges for the district to issue an arrest warrant for the suspect. There are eight district judges and eight magistrate judges in the United States District Court for the Eastern District of Texas. The judge to whom the case is assigned will review all of the evidence presented by the AUSA, including affidavits from the investigating agents, and decide whether probable cause exists for an arrest. If the warrant is issued, law-enforcement agents will arrest the suspect and bring him to a detention holding facility in East Texas. At that point, the suspect will meet with a pretrial services officer. Pre-trial Detention Hearing. The Constitution requires any person who is arrested to appear before a judge within a specific time frame after the arrest. In federal court, this initial presentation is called the initial appearance hearing. At this hearing, a federal judge determines whether the arrested individual must stay in custody pending further proceedings or can be released on bond. The judge will also determine if the arrested person should be appointed an attorney because he cannot afford his own. Importantly, the initial appearance hearing occurs before the suspect has been formally charged with a crime and does not address whether or not the suspect will be formally charged with a crime. In Beaumont or Lufkin, the initial appearance hearing will be conducted by Judge Keith F. Giblin or Judge Zack Hawthorn. In Tyler, the presiding judge will be either Judge John D. Love or Judge K. Nicole Mitchell. In Marshall, the magistrate judge making the bond decision is Judge Roy Payne. Indictment or Information. A person is formally charged with a crime through either an indictment or an information. An indictment is a charge issued by a federal grand jury after a confidential proceeding at which the prosecutor presents the case without the defendant’s participation. If the grand jurors agree that it is more probable than not that a crime was committed by the suspect, the suspect will be indicted. To avoid the grand jury proceeding, a suspect’s counsel may choose to waive the suspect’s right to a grand jury and accept a document called an information, which contains the same formal allegations. Once either of these documents is issued, the suspect has been publicly charged with a crime. Arraignment. Next, the defendant will return to court to be arraigned, or formally charged. The judge will announce that the defendant has been charged with a crime, explain the nature of the charge, and ask the defendant for a plea of guilty or not guilty. Most times, defense counsel in East Texas will advise their client to plead “not guilty” because they have not yet seen the evidence the AUSA has gathered in order to make an informed decision about whether or not to seek a plea deal. Discovery. After the arraignment, the discovery period begins. Importantly, the government has what is called a “Brady duty” to disclose all of its evidence to the defendant. whether or not the evidence is favorable to their case. Once the defendant has an opportunity to review the evidence, he and his lawyer can make an informed decision about whether to go to trial or to seek a plea deal. Plea Bargaining. In almost every case in the Eastern District of Texas, defendants choose to enter a guilty plea rather than go to trial. If the defendant chooses to plead guilty, he will return to court, where the judge will explain the consequences of pleading guilty and articulate the specific charges to which he is pleading guilty. Next, the defendant must plead guilty in open court. Sometimes, defense counsel will be able to agree on a plea deal with the AUSA, which could contain an agreement about the maximum sentence to which the defendant could be subjected. Motions & Trial. If the defendant chooses not to plead guilty, the case will go to trial. The court will impose deadlines for certain pretrial tasks, such as motions, disclosure of witness and exhibit lists, and inquiries into legal arguments. At trial, one of the sixteen judges for the Eastern District of Texas will preside over the case, and the case will ultimately be presented to a twelve-member jury. The jury is in charge of making factual determinations about the circumstances of the case, and the judge is tasked with interpreting the laws that apply to the case. Federal Sentencing. If the defendant pleads guilty or is found guilty at trial, the case will then move into the sentencing phase. The jury is not involved in sentencing; the judge alone will make the decision based on a variety of factors, including the sentencing recommendations from the U.S. probation officer assigned to the case, the facts, the applicable law, the Federal Sentencing Guidelines, his or her own judicial discretion, and constitutional constraints. The defendant and his attorney are given the opportunity to address the court before the sentence is pronounced. Supervised Release. If the defendant receives a prison sentence, the judge may also order a period of supervised release to follow incarceration. Under supervised release, a defendant is required to follow certain conditions and restrictions in order to ensure that he reintegrates into society in a lawful manner. Some of the most common conditions imposed in the Eastern District of Texas are that the defendant may not violate any state or federal law, that he pass drug tests, that he does not associate with known criminals, or that he periodically check in with the U.S. Probation Office. Federal Appeals. Convictions at trial, and, occasionally, plea deals and sentences, can be appealed. By filing an appeal, the defendant asks the U.S. Court of Appeals for the Fifth Circuit to review his case for factual or legal errors. Some of the most common reasons to file an appeal are that evidence was obtained unlawfully, that the prosecutor had exculpatory evidence that he or she did not disclose to defense counsel, and that the trial judge abused his sentencing discretion. Contact our offices today for a free consultation and evaluation of your case. We are here to help you!